I am designing a magic system that allows for some degree of both time travelling and teleporting. Although it is a magic system, I want it to be as scientific as possible because it will be used in a heavily science-driven magic-considered-unreal world set. So far I have the following structure: there are three separate planes with different types of energy, but they are connected (I imagine three balls connected by string so as to make a triangle shape) and moving. 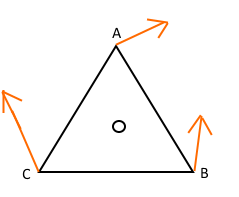 Time is their trajectory and its axis goes through the centre of the triangle shape. The tricky part comes next: the three balls move at different speeds, though, so they should not be going in a straight line parallel to their axis, but more behaving like a sort of spiral in a tri-helix. The non-linear movement will allow for moments when one ball-plane crosses the past or future path of the other ball-planes which allows for limited time travelling windows. 1) How stable would this hellix be as the "balls" affect each other? Answer attempt: If ball A moves at speed 1, ball B at speed 2 and ball C at speed 3, then the drag of the first ball would make ball C curve into a circle and this would all look like an airplane spiralling into the ground. 2) How would their movement affect their trajectory? Answer attempt: If my prediction above is correct, then even the axis would be turned from a straight line into a spiral, perhaps not a circular one but an oval due to additional drag from ball B. At an extreme, the trajectory would actually loop. 3) What algorithm and software could I use to plot this into a visual? Note: my maths is years behind, but pointed in the right direction I am capable of self-teaching (or paying for a tutor) to fill me in on the required knowledge to pull this through. The idea is that the balls are always connected. If the 1st goes faster, it pulls the 2nd behind it, and both the 1st and 2nd pull the third ball behind them. But at the same time, the 3rd ball, which is the slowest, will pull both the first and the second behind, while the 2nd will pull the 1st behind less strongly. I figured that the conflict of pulling forward and dragging backwards (plus the different speeds and the tringular shape) would set the whole structure girating. If all three balls are connected by "string" and interacting you're going to have trouble making it look like a helix. However, there are some interesting solutions. The most interesting, to me, is if you snip the string that goes between 1 and 3, so that they can only influence each other by influencing 2 (which then goes on to influence 3 or 1). If you do this, from the perspective of the heaviest ball, you get an interesting pattern. You have the heavy ball "stationary," because we're viewing this from its perspective, with a ball moving at a medium speed connected to it, and a fast ball connected to that. What's interesting about this is that it describes the Double Pendulum, which is one of the more famous chaotic systems out there. Chaotic systems have a neat advantage: any situation which is energetically possible will eventually happen, and often for reasons that cannot easily be explained ahead of time. This means, as you go about writing your story, any situation you might want the three balls to be in is possible! It's very easy to use math to write yourself into a position where the plot you want cannot mathematically happen by the rules you constrained yourself to. Chaotic systems are very good at helping you avoid painting yourself into such corners. I think it helps to have a picture of the entire thing. 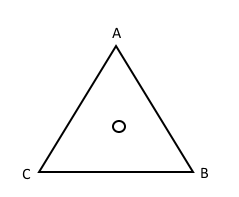 Where A, B, and C are your three 'Balls', the triangle lines the energy bonds connecting them. It is a top-down view where the circle is the time axis that extends straight upwards out of the paper/computer screen. Now, let's add the velocities to the image. 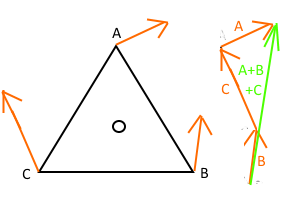 In this simplified view, I will just ignore the temporal component of the velocity (the one reaching out of the paper or into the paper) to get a basic understanding of how your triangle can behave. The orange arrows indicate the directions your balls would go if they had nothing holding them back. The longer the arrow, the faster the ball would go. In physics, this kind of arrow (indicating direction and speed) is called a vector, or a force. The total sum of the velocity vectors is 0 -- meaning that the triangle will not move away from your time axis. 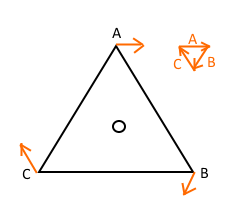 However, the triangle will start rotating around the time axis, which is exactly what you want. On the other hand, note that the three arrows have the exact same length, which means they are moving with the exact same speed. Which is not what you wanted. So, if I remove the restriction that the connecting lines are rigid, the Three-body problem might help you with imagining what the movement of your 3 balls would look like. Note that the restriction having the same speed time-wise (in your 4th dimension extending out of the paper) would still apply because the simulation can only deal with different space velocities! Sverre.com has a nice 3body simulator where you can experiment with varying initial velocities and masses. However, gravity might not be a good analogon to your connecting energies, since it acts the exact opposite way of a bungee cord (the closer two bodies are together the stronger gravity is, but the weaker the hold of a bungee cord is). It might give you an impression of how chaotic the motions will be. Now, if you want an exact portrayal of the bungee-cord rules plus the different temporal velocities, you will have to set up the numeric equations (probably some kind of differential or even partial differential equations) yourself and plug them into a kind of numeric simulator. Matlab is a very good one I have used to great effects already. even if you do get a nice numeric simulation -- what will it help you for your world-building? What exactly is it that you are trying to do with this simulation? Finding out how often such 'crossing-trajectory' events happen? It might be a bit disappointing, but it is very probable that when you change even small bits of your initial numeric problem conditions (where the balls are, what initial velocities they have, the rules that define your connecting bungee cord) your entire simulation will change so much that you get entirely different results. Try to get a good idea of what the very simplified view (rigid connections, same temporal velocities) looks like and what it implies for helix-like motions. Then experiment a bit with the 3-body-simulator -- and fill the rest of the information with your imagination. Do you really think anyone will try and tell you that you have initialized two jump-points too many in your world? Could time travelling be a realistic means of travelling great distances? Could a time-travelling doctor produce a bacterial vaccine? Can a single time travelling person prevent the World Trade Center attacks? Would a time-travelling blockchain destroy a cryptocurrency?